Heat oven to 400°F. Spray 13x9-inch (3-quart) glass baking dish with cooking spray. In 10-inch skillet, cook beef over medium-high heat 5 to 7 minutes, stirring occasionally, until brown; drain. Layer cottage cheese and Parmesan cheese in baking dish. 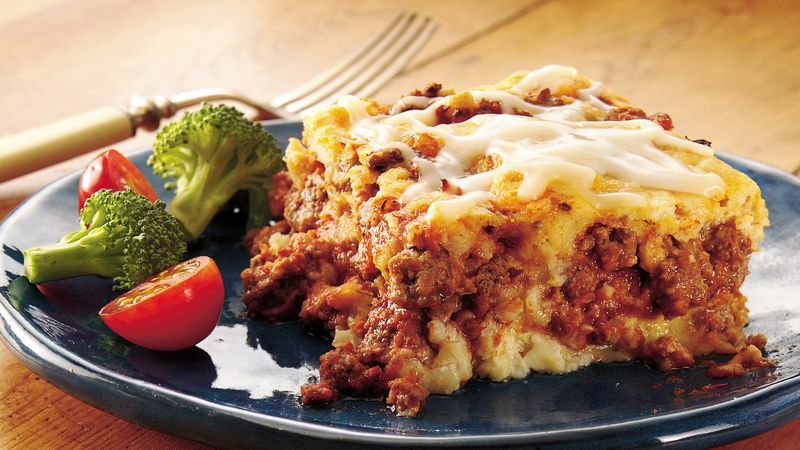 Stir 2 cups of the mozzarella cheese, the Italian seasoning and tomato paste into beef; spoon beef mixture evenly over cheeses in baking dish. In medium bowl, stir remaining ingredients until blended. Pour over beef mixture. Bake 40 to 45 minutes or until knife inserted in center comes out clean. Sprinkle with remaining 1 cup mozzarella cheese. Bake 1 to 2 minutes longer or until cheese is melted. Let stand 5 minutes before cutting.